The Baltic ecosystem is fairly simple when it comes to commercially exploited fish. While flounder, plaice and salmon make up a small portion of the commercial annual catch, the most lucrative fish are cod, herring and sprat. Today’s Baltic fisheries, captured aboard over 5000 fishing vessels, are worth around 240 million Euro per year, mostly from those three fish. But the fisheries are in danger. At its peak in 1984, fishers landed more than 440,000 tonnes of Eastern Baltic cod. Today, they bring home less than 50,000 tons annually. The number of cod in the Western Baltic Sea has dwindled to the point that they are on the brink of collapse. And in recent years, the Eastern Baltic cod have shrunk: cod longer than 45 centimeters have virtually disappeared from the Eastern Baltic Sea. 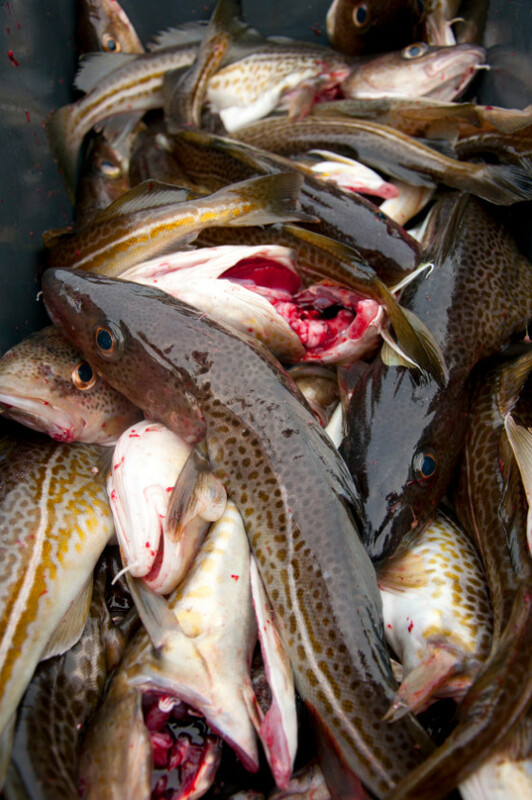 Scientists are still trying to determine why the cod are so small. Occasional inflows of saline, oxygen rich seawater from the North Sea temporarily boost stock productivity. However these inflows are inadequate to replenish in the cod stocks completely. Poor fishing practices coupled with eutrophication, fed by agricultural runoff, as well as temperature changes, have put the Baltic ecosystem in jeopardy. Today, as cod has declined, pelagic species (sprat and herring) have come to dominate the Baltic fisheries. Harvests of sprat, for example, have grown from a low of around 50,000 tonnes in the early 1980s to nearly 250,000 tonnes in 2014. Much of the pelagic catch is processed for industrial uses and animal feed. Perhaps the future path for sustainable Baltic fisheries can be seen in the rise and fall of herring, and its rise again: In the 1970s, fishermen caught more than 350,000 tonnes of herring, and today’s herring catch is closer to 110,000 tonnes – though not because the stocks are declining. After high fishing pressures in the 1990s, and a drop in the stocks, herring began to recover after 2004, possibly because of better fishing limits. However, the European Fisheries Council continues to set catch limits that exceed scientific advice. Properly set limits for all Baltic stocks would assist populations under pressure to bounce back, particularly cod, helping maintain ecosystem biodiversity, generate employment in coastal communities, and provide local food for human consumption. Policy and regulations play a key role in protecting Baltic fisheries. FishSec is working with the fishing sector and policy makers to improve sustainability in the Baltic fisheries. We recommend setting fishing limits according to scientific advice and support low-impact fishing methods, another critical step toward sustainability.